Important Historical Note: Over the years, the ribbons have been removed. For the purpose of photographing the uniform, I've loosely attached them to their proper positions, based on the official order of precedence and photos of other period uniforms. If this is not correct, please email me with the proper placement. 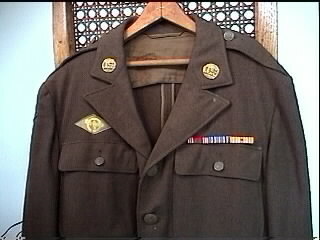 The ribbons attached to the uniform are the originals. 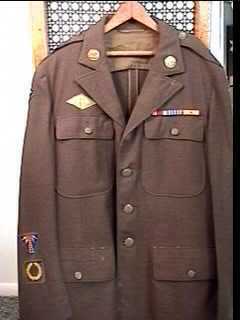 I believe the WWII Victory Medal was not available when dad got out and was not on his uniform. 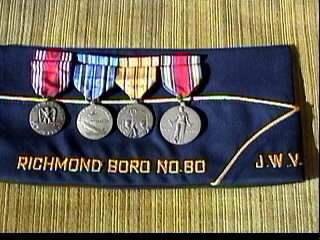 The medals photographed on dad's JWV cap were ordered by my father from the VA in the 60's. Unfortunately, I don't own a digital camera. 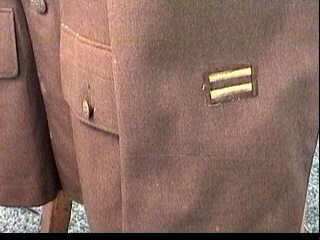 These photos are video frames from my camcorder, converted to .jpg format. As you view each picture, use the back button on your browser to return to this page. 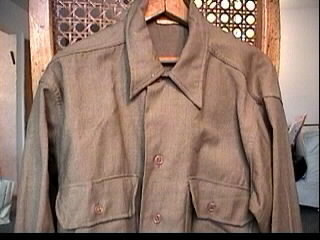 The Jacket(1) The woolen jacket, size 40 Short. 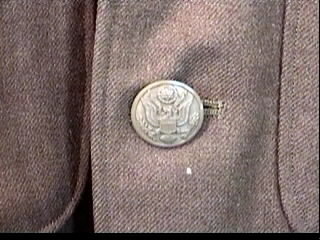 The Jacket(3) Detail of left breast pocket, see note above. 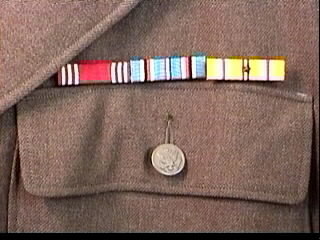 (L-R) The Good Conduct Ribbon, The American Campaign Ribbon and the Asiatic Pacific Campaign Ribbon with Battle Star for the Luzon Campaign. 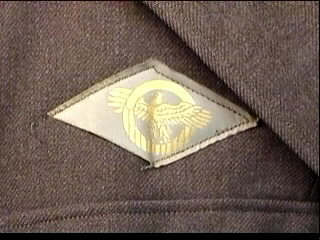 The Jacket(4) Detail of right breast pocket showing the Discharge Patch. 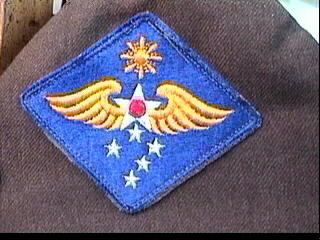 The Jacket(5) One of the jacket buttons. 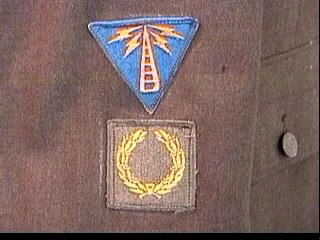 The Jacket(6) Lower right sleeve showing Communication Specialist Patch (top) and Meritorious Unit Citation Patch. 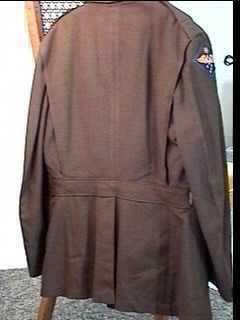 The Jacket(7) Upper right sleeve showing combat patch, Far East Air Force. 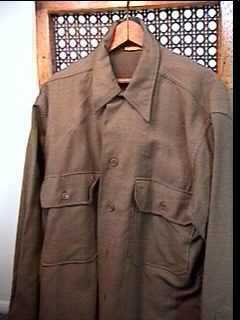 The Jacket(8) Lower Left sleeve showing 2 bars, each indicates 6 months of overseas service. 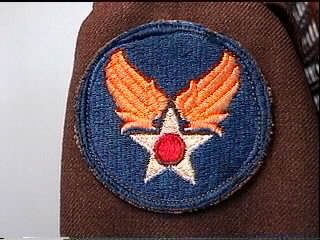 The Jacket(9) Upper left sleeve with the vererable Army Air Corps unit patch. The Jacket(10) Rear of jacket with clips for the belt. 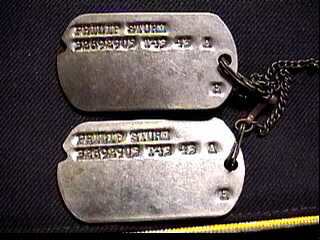 The Dog Tags Identification tags with fragment of chain. Medals (front) Dad's medals displayed on his Jewish War Veterans cap. 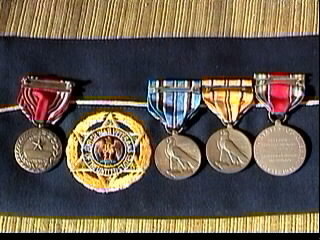 (L-R) The Good Conduct Medal, The American Campaign Medal, The Asiatic Pacific Campaign Medal and the World War II Victory Medal. Medals (rear) A rare display of the back of the Medals, on the other side of dad's JWV cap.